Dr Zhong is fully qualified to diagnose and treat a wide range of ailments in Chinese medicine and has over 20 years of extensive clinical experience. He provides a high standard of professional medical service. Bring the benefits of Chinese medicine to the local community of Walthamstow. 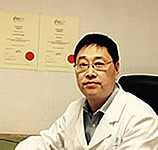 Dr Zhong qualified from Nanjing University of Traditional Chinese Medicine in 1991, having spent several years of study. With at least 25 years of practical experience, he holds a high level of expertise in dealing with many common clinical disorders, from skin problems to internal conditions. Dr Zhong is also a qualified Chinese herbalist, and as well as carrying out traditional acupuncture he is able to do Tuina Massage. Combining his solid knowledge on Chinese medicine theory, acupuncture and massage with practice on typical British patients. He specialises in using acupuncture and massage treatment to relief pain and curing many difficult diseases of internal and emotion. 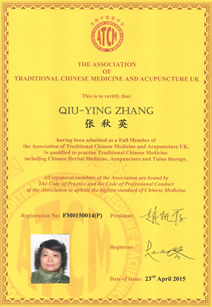 Member of ATCM - Uk's Leading healthcare organisation for Traditional Chinese Medicine and Acupuncture. 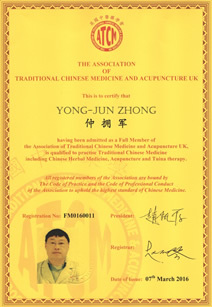 Dr Zhang is also fully qualified to practice Traditional Chinese Medicine. 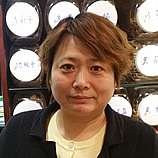 She graduated from Nanjing University of Traditional Chinese Medicine in 1993. So has over 23 years of experience. Two areas that she specialises in are in treating dermatological problems and female reproductive problems. Dr Zhang is good at using traditional Chinese herbal medicine to treat or prevent health problems. Such as depression, menopause, rheumatism and dermatitis. Our clinic is the leading Chinese medicine and acupuncture centre in Walthamstow.